I really wanted to share the story behind this photo of beautiful Savannah as her and mum really inspired me. Savannah’s mum reached out to me wanting a newborn session for her baby girl who is now 11 days young and had just come out of the NICU (Neonatal Intensive Care Unit). Savannah has a hipdysplasia, a developmental condition which affects the soft hip bones in babies causing them to become dislocated, and is unfortunately painful for baby. To treat this condition, Savannah needs to wear a ‘Pavlik’ harness which basically acts as a cast to fix her legs into position, meaning the little girl cant flex like bubs normally do. She will need to wear this harness for at least 6 weeks. This condition and the harness meant I was unable to do any of the traditional posed photos that I would normally do. Instead I decided to split the session into two. 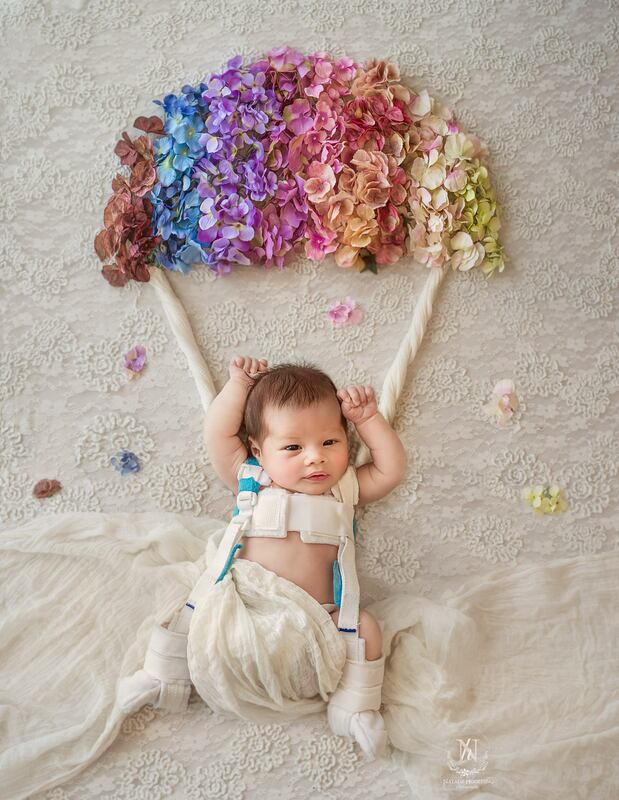 I really wanted to get a newborn photo of Savannah as she is today, and came up with this parachute concept to tie in the harness. It was a bit difficult as I could tell that she was in a lot of discomfort because of the harness and mum said they had both been up all night. Thankfully we got the picture we wanted and in 6 weeks time I’m looking forward to them both landing in my studio again, so we can take some more photos of this beautiful sweet soul.